Tired of reading about princesses to his young daughter and discovering the lack of “true surf vibe” children’s books, Chris Gorman and his daughter Indi, decided to change this. They collaborated to write an inspiring children’s book about a young surf girl who takes to the waves in Indi Surfs. Chris “was inspired by decades of surf art and a wide variety of amazing surf artists such as Rick Griffin, John Severson, Shepard Fairey and Raymond Pettibone just to name a few. In creating the book I chose to strip away all the possible sub-plots and messages and just depict the act of surfing in a simple and beautiful way.” We spoke with Chris about his new soon to be released book Indi Surfs. What has been the most thrilling part of writing and publishing Indi Surfs? Well it’s not out yet so it’s hard to say what will happen. It’s been a pretty long process, and the stage I’m at now with marketing it and trying to get it out there and get it noticed is stressful. I did get a lot of rejection notices, and meetings that went poorly, also had lots of book samples returned unopened so the biggest thrill at this point was getting a letter that said ‘we want to publish your book,’ that is a pretty big deal. I feel like a big segment of the publishing world thinks surfing is a small time phenomenon. I sat in a meeting with one publisher who said this was a book that only had a market in California. Time Square has 2 surf shops. Brooklyn has as many surf shops as any beach town in California, half the Viagra commercials and nearly all the catalogs in my mailbox have a person with a surfboard as the focus. Surfing is a genuine American sport/pastime/lifestyle. 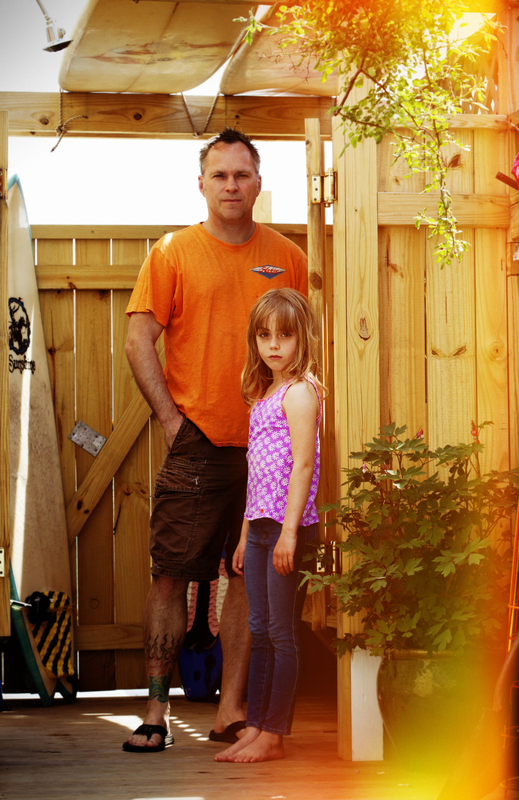 What does having your daughter surf mean to you? Surfing is tough for a parent with young kids. All that time you had as a non-parent is eaten up pretty quickly. I think all parents secretly want their kids to adopt similar interests for obvious reasons. I want my kids to love surfing so I can surf more, take them to the places I love, get them up at dawn and paddle out! This book is a work of fiction. My daughter has most of the traits of the girl in the book, the drive, tenacity, etc. but she isn’t the surfer you see in the book. I hope one day she will be if she wants to. A big part of writing a book like this was because there wasn’t one out there that I could find. I was reading books to her about princesses, and ponies and fairies and I really wanted to read a book to her about a surfer girl. Can you describe the first wave your daughter caught by herself? She caught a real wave when she was 4 on a boogie board. We got it on video. The look on her face when she realized she had somehow harnessed this fast moving wall of water is priceless, and it’s probably the look we all get when we catch a good one. My big focus with her and her brother now is swimming. I was a good swimmer as a kid but as a teen I surfed so much I started relying on my board. My first trip to Hawaii I got caught out at a place called log cabins when the swell jumped from 3 feet to about 10 feet in a very short time. It was a very ‘north shore’ moment and I was the worst kind of gringo, got pitched, leash snapped and I FREAKED OUT. I was super lucky to be in the water with some friends who grew up there because I’m not sure if I had the skills to negotiate that situation properly. We live on an island so even if my kids don’t fall in love with surfing they are going to be strong water-people. Tell us how you go into surfing? We moved a lot when I was growing up but we lived for a pretty good stretch in a town in Rhode Island called Little Compton. My brother and I found a few boards that had been left behind at a friend’s house and we started dragging them to the beach to goof around on. This was about 1980 so they were beat up old thick single fins, but they were good enough to catch waves. Years later we would realize that Little Compton was a pretty unique place with really good breaks. It was so isolated we rarely ever saw other surfers at this time so we didn’t know how good we had it. During high school we moved to Newport which had a real growing surf scene, and that’s when we got into better equipment and really learned how to surf. Are there plans to write more surf-based children’s books? I certainly have plans for more books! Thanks so much for talking with us, Chris. We are looking forward to reading the book. Indi Surfs will be released to the public on June 27th 2015, but it is available for pre-order on Amazon and many other book sellers websites or through the PowerHouse Publishing or Random House Publishing site.